Tomorrow is FAMILY NIGHT at the Iowa Barnstormers game! Mascots from all over the Des Moines area are joining us for a great time along with some of our Star Wars friends! $9.00 family tickets are still available - call 515-633-2255 to order yours today! Enjoy $1.00 hot dogs throughout the first quarter of the game! 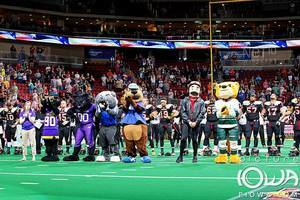 Check out the amazing mascots that will be joining our very own Billy the Barnstormer and his dog Ace!